inscription: "Beefeater Dry Gin, 100% grain neutral spirits. 47% alc./vol. Hiram Walker & Sons, Inc., Farmington Hills, MI (c) 1992" printed in black ink at the bottom right corner. 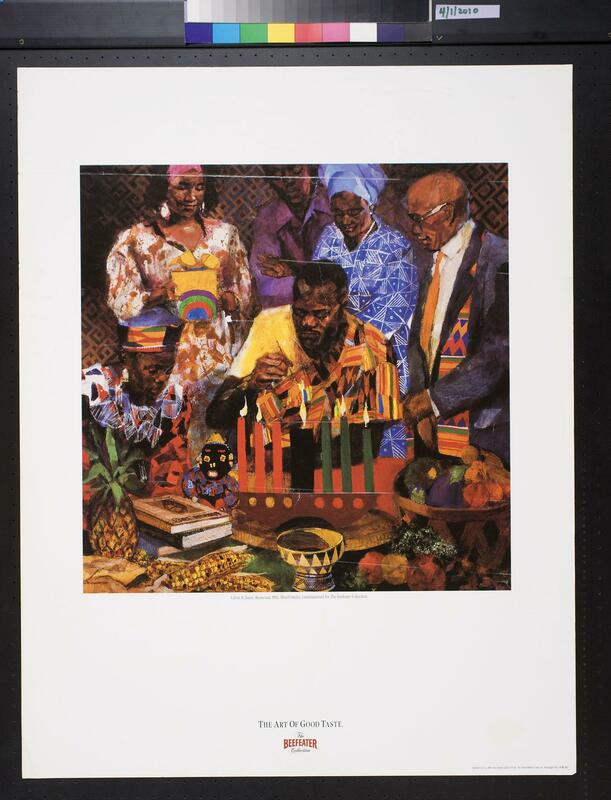 Poster has a polychromatic image of a man lighting the candles on a kinara (candle holder) for Kwanzaa surrounded by male and female figures. Beneath the image is black text reading "Calvin B. Jones, Kwanzaa, 1992. Mixed media. Commissioned for the Beefeater Collection". Centered at the bottom of the poster is the Beefeater logo in black and red. Printed on white paper.